Today marks the beginning of Holy Week. And, like every special occasion, I find myself doing things and making certain foods just so that I can keep a connection to my upbringing and my family. On occasions such as these, I pick up the phone and call my mom to tell her what I'm making... reinforcing the bond. And then I'd ask what everyone else was doing, picturing everyone in my mind and wishing I was there. I've always found Cross Buns to be blah. You? They always need something to go along with them - butter, jam or jelly. I was thrilled last year when I took the best qualities of my Butterflaps, an Amish White Bread and Coconut Turnovers and created a Cross Bun recipe that totally satisfies me. The only thing that is optional here (and that is if you want to put it over the top), is to cut the bun in half and insert a slice of aged cheddar cheese such as New Zealand or English cheddar. Sooooo good! Here's the recipe, have a go at it and let me know what you think. And now for the introduction. Remember I told you last week that I was going to tell you about the woman in the first photograph in this post? Her name is Halcian Pierre and she blogs at Come Taste This! What an excellent name! Halcian only started blogging in January of this year, so please join me in giving her a very warm welcome to the world of food blogging; do stop by and visit and add her to your RSS feeds. A former magazine writer and journalist, Halcy as she is fondly called is in the final stages of putting together her first cookbook, What We Eating. Well, with a blog called Come Taste This, I cannot wait to find out What We Eating! Try her recipe for Pineapple Chow. Trust me, you've never had pineapple like this before. I had it for the first time last month when I was in Trinidad. 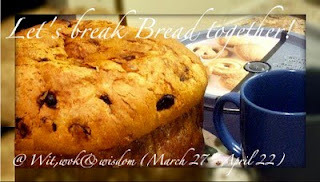 I am sending my cross buns over to Wit, Wok & Wisdom as she is hosting her very first blog event - Let's Break Bread Together! If you have a bread post of any kind, do join in the event.